Allows the user to access the graphical interface of the application through an Internet Explorer web browser. 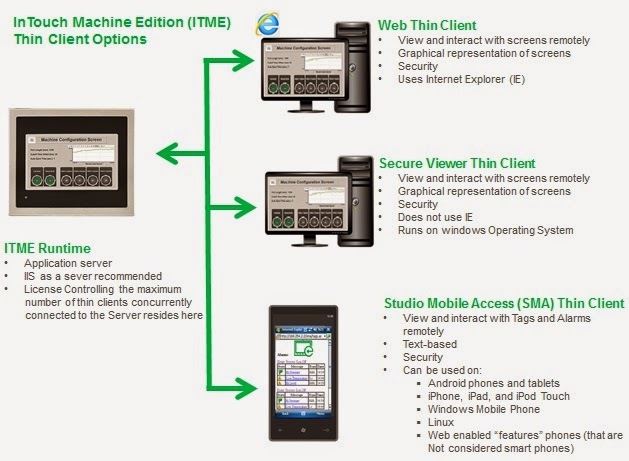 It requires the installation of a plug-in (ISSymbol ActiveX control), which is done automatically when the user attempts to visualize the screens for the first time from the Web Thin Client station (as long as the security settings of IE allows to automatic installation of plug-ins). Ideal for multi-purpose stations (e.g. : Manager’s computer). Allows the user to visualize tag values and alarms from any web browser. Ideal for legacy mobile devices with web browsing capabilities. (the future version of the product will support the graphical screens designed with the standard graphical editor of ITME to be displayed on any web browser that supports HTML5). If you want to catch the best of blog.wonderware.com subscribe to our the Wonderware HMI/SCADA Times weekly newspaper. It's a single email digest that you can use to catch up with great posts on your own time.